TRIVIA of Noh : Q114 : What was the origin of kogaki? | Home | Trivia | Q114 : What was the origin of kogaki? 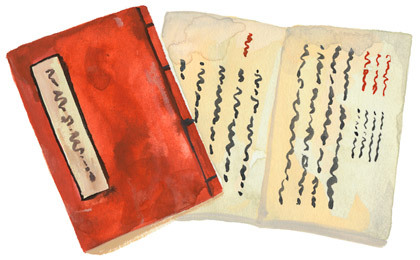 What was the origin of "kogaki"? In some Noh program listings, the word "kogaki" appears in small print on the left of the titles. Kogaki denotes a special dramatic interpretation of Noh, Hayashi (music) or Kyōgen. There are several types of kogaki, including experimental productions described in ancient books and ingenious modern attempts. It seems to have been after the middle of the Edo period that kogaki first appeared on program listings as it does today. Kanze Motoakira XV, the head of the Kanze school in the mid-Edo period, frequently used kogaki to exercise his ingenuity in dramatic interpretations. Motoakira started the revival of the Kanze school and enhanced its authority by serving as the personal Noh teacher of two Tokugawa shoguns, Ieshige and Ieharu. He loved the study of Japanese classical literature and culture. From this learning, he brought together traditional styles of Noh production and created his own new style of kogaki interpretations. He also carried out reforms such as the publication of "Meiwa Kaisei Utai-bon (Noh Librettos Revised in the Meiwa Era)," a collection of plays drastically revised from the traditional versions. These revised plays were unpopular in Noh circles because the performers had to re-memorise every piece and they were eliminated after Motoakira’s death. His special kogaki interpretations, however, have been built on by the Kanze school and also influenced other schools to create their own. The Kanze school now has almost 400 kogaki, far more than the totals of other schools (the Konparu school has about 50, the Kita and Hōshō schools about 100 each, and the Kongō school about 200).